A bus hostess serving drinks to a guest during an opening of Jagadamba bus service from Pokhara to Lumbini in Pokhara on Monday. By Rup Narayan Dhakal : Pokhara—Jagadamba Travels Pvt. 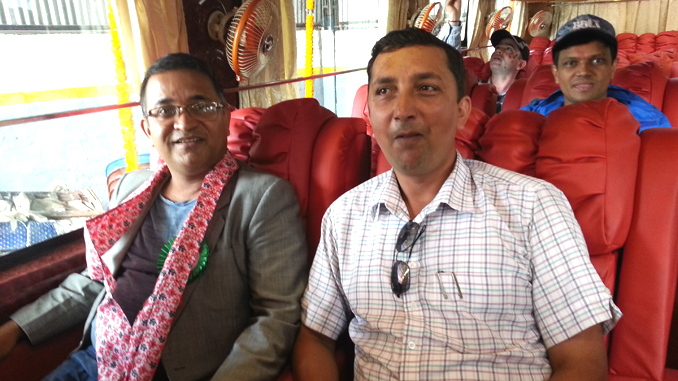 Ltd. is to start a tourist class deluxe bus service in Pokhara-Lumbini route from September 1. There has not been operated such bus service in this route yet. 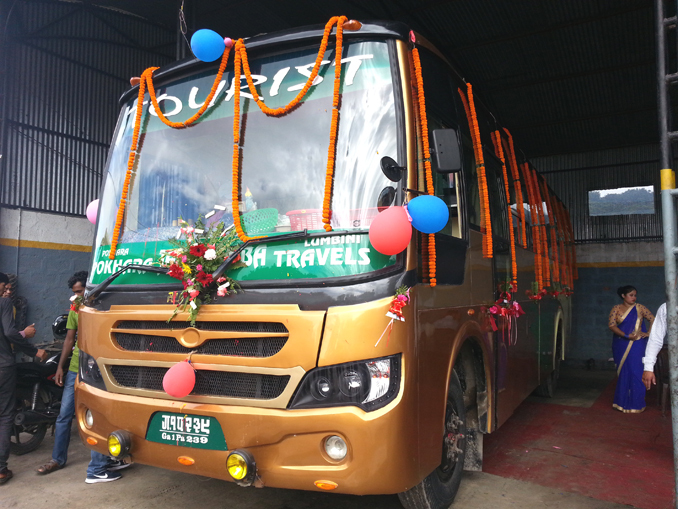 According to company’s chairman Keshav Prasad Adhikari, the bus leaves from Pokhara at 7.45 in the morning everyday and goes through Narayangadh, Butwal, Bhairahawa, Sunauli to reach Lumbini. Earlier, the company has been operating its bus services in Pokhara-Kathmandu, Pokhara-Sauraha and Pokhara-Delhi routes. Sound system, fan, TV, breakfast, tea and cold drink facilities are available in the 20 seater bus and the lunch would be provided during the journey in the route. The per ticket costs Rs 20,000 for Nepali and Rs 2,500 for foreigner. Jagadamba Foundation Guardian Drona Raj Adhikari inaugurated the bus service during a press meet organized in Pokhara on Monday. 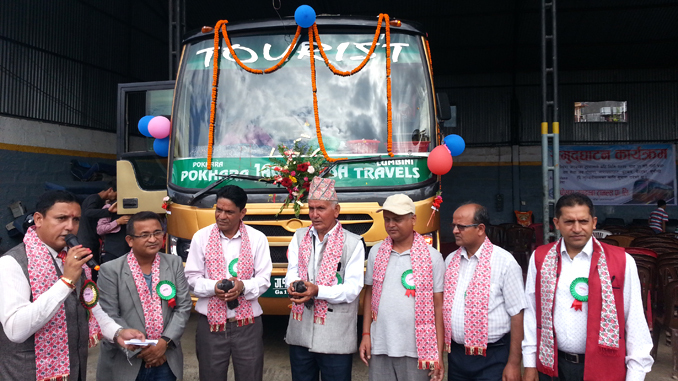 Foundation member and PCCI general secretary Damu Adhikari informed that the company is going to start the bus service from Pokhara to every province capital and major cities of Nepal in near future. 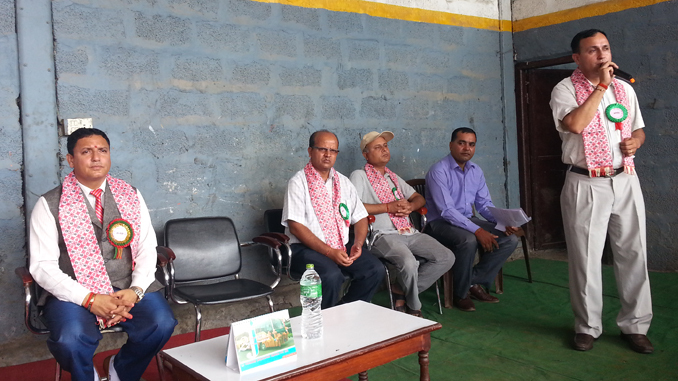 Tourism Expert Basu Dev Tripathi, Pokhara Tourism Council chairman Kedar Nath Sharma, FNJ Kaski former chairman Punya Paudel, Paschimanchal Hotel Association Pokhara general secretary Ganesh Raj Pahari and FNJ Kaski chairman Dipendra Shrestha wished for continue service of that company during that program.